September 12, 2017 marked the first of ‘Songs and Stories of Migration and Encounter’ six weeks of weekly workshops for youth ages 12-18. Each week we will meet in four community locations: at Menelik Hall in Whitney Pier on Tuesdays from 4-6PM, Place des arts Pere-Anselme-Chiasson in Cheticamp on Wednesdays from 3-5PM, and on Thursdays at Centre Communautaire Etoile de l’Acadie in Sydney from 3-5PM, and Membertou Heritage Park in Membertou from 6:30-8:30PM. The main focus of our first weekly gathering was to introduce youth participants to one another and to our workshop facilitators, Ons Barnat, a post-doctoral research fellow from Montreal and Thomas Colford, professional dancer and choreographer originally from South Bar. In Membertou, co-facilitators include Shaylene Paul and Shirley Christmas. We warmed up with some ice-breaking activities and discussed our plan for next six weeks of workshops. 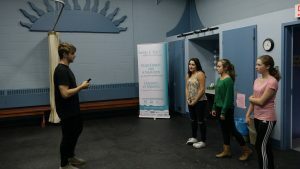 At Menelik Hall, youth from Whitney Pier and Glace Bay were all curious and responsive to the exciting technology we shared, like the 360 degree camera, which helped us create a short virtual reality film right on the spot that night! 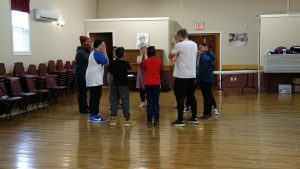 In Chéticamp, we met with youth who love to step dance, make music and act. At Étoile de l’Acadie, we went outdoors to some activities including where the youth used the 360 degrees camera, and captured their peers performing in the playground. Co-facilitators Shaylene Paul and Shirley Christmas worked with us and a large, vibrant group of both Indigenous and non-Indigenous youth at Membertou Heritage Park. Elder Shirley is very passionate about engaging the youth and shared her knowledge. She spoke about how her ancestors have given songs and poems to her through her dreams. After some truly moving storytelling, we made our way outdoors for more fun and activities with the 360 degree camera! It has been wonderful to begin our workshops together this week – to learn about the passions, skills and personalities of youth and elders around the island. We are looking forward to the second week of workshops. In this second week, dancer Thomas Colford and theatre scholar Dr. Heather Fitzsimmons-Frey (visiting from Toronto!) will lead story sharing sessions with community elders as we begin to create our new performance pieces.